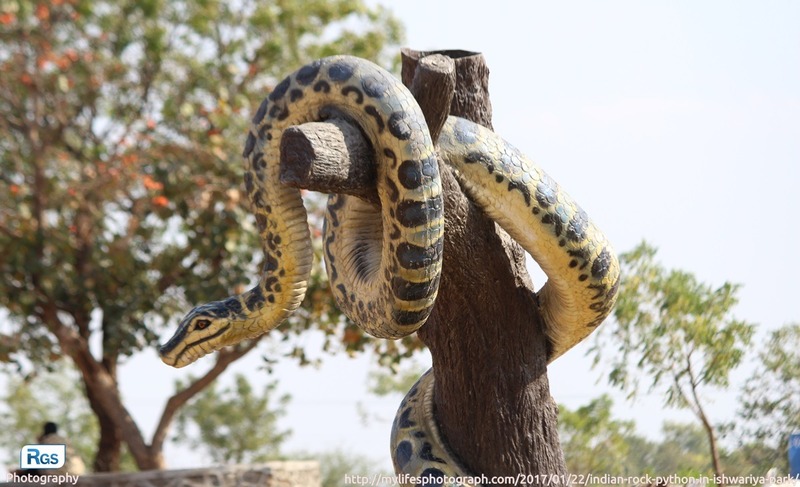 I have captured this photo of the rock python at Ishwariya Park, Rajkot. This python is not a real but The artist who made this extraordinary art, gave original shape to it so, it looks like the original. If the artist wants, they can do anything for their artistry. There are lots of other animal statues in the garden like tiger, rabbits, and giraffe. I really appreciate the work of artists who made these. If I talk about this garden, this garden is known as Children park and famous place for the picnic in Rajkot. Ishwariya park is approx 8-10 Km from Rajkot city area. This park is spread over 77 acres and located on Jamnagar road. At here, there is a temple of Lord Shivji(Mahadev) which is known as “Ishwariya Mahadev” and there is a lake which is in a back of the park. This park is opened in 2008 by honorable former Chief Minister of Gujarat state Mr. Narendra Modi. If you want to know more about the park timing, contact detail and other thing, Go to the following mention link: Location and Timing Details by nrigujarati.co.in. Wow that looks so cool you’re really good at taking pictures that looks great. nice..my frnd……..u r just superb…………. Just wow…. nothing to say.